My father, Darryll G. Boos, was the owner of the "Inferno" back in the mid 1960's into the mid 1970's. There were I believe 10 5.5m sailboats in Menominee, Michigan during that time that raced every week Tuesday's and many weekend races. Eventually some of the 5.5's were sold with fewer boats to race against my dad sold the Inferno. I remember watching many of the races. The boat owners were a close group as well as very competitive. I have documentation of most of the boat numbers, names, colors and owners and will post them. My father, Darryll G. Boos, was the owner of the "Inferno" back in the mid 1960's into the mid 1970's. 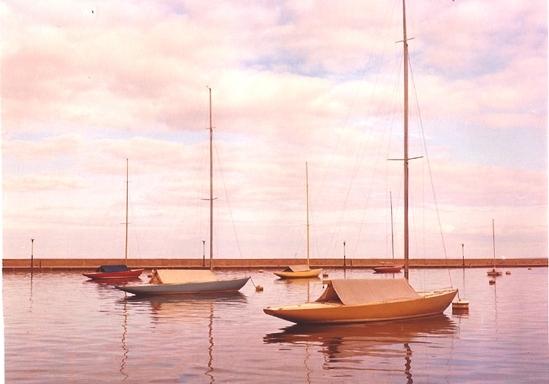 There were I believe 10 5.5m sailboats in Menominee, Michigan during that time that raced every week Tuesday's and many weekend races. Eventually some of the 5.5's were sold and my dad sold the Inferno. I remember watching many of the races. The boat owners were a close group as well as very competitive. I have documentation of most of the boat numbers, names, colors and owners and will post them.